You’ve heard the expression before, “When it rains, it pours”. Well friends, it came a monsoon on me. It did not just rain. We had a full blown (not really, but kinda felt like it) hurricane. I felt like I had been beaten by the time I finally figured out which way was up. Today is Monday. Day 12 of what I now refer to as the Bell Twin Plague of 2016. Friends, I feel as if I have crawled out of the trenches battered and beaten – covered in snot and smelling of disinfectant. R&A began a little Parents’ Day Out (PDO) program on September 6th. On the evening of September 7th, Trey and I closed on a little investment property we’ve had our eye on. In that same evening, Ryker began running a fever. It was all downhill from there. . .
On Thursday, September 8th I sent Averlee to PDO sans her sidekick , Ryker, because she was feeling just dandy and she LOVES school. I took Ryker to the doctor to get checked out in hopes we could nip whatever was trying to invade his little body before the weekend. Ohhhh how naive and hopeful I was, right? We were fortunate to get worked in pretty quickly. Once the Physician Assistant took a look at Ryker, she told me there are a few yucky viruses running rampant currently. Ryker tested negative for strep, but she could not rule out Hand, Foot, and Mouth Disease (HFMD) . Fan-freakin-tastic. So on we went with our day. I called the director of PDO to inform her there was a possibility my child may have HFMD just so she would be aware in case some extra sanitizing efforts were needed. I told her Averlee had obviously been exposed, but she didn’t have any symptoms that morning. With that being said, I had to pick Averlee up from school before she had a chance to share her germs with all of her new friends. So there I was at home with a daughter who wanted to play, run, jump, hop, and eat and a son who just wanted to be held. Needless to say, I had to call in some reinforcement for the remainder of the afternoon. There just wasn’t enough of me to go around! It worked out though because I had an appointment to work on some legal paperwork later that evening. I needed a babysitter anyway. Then came Friday, September 9th. I had a brief health scare about month prior regarding a suspicious lump in my right breast. The appointment on the 9th was just a follow-up to see what that pesky thing was up to. Honestly, my mind was a million other places on that day, so I wasn’t too concerned. I had full faith the doctor would check me out and tell me to come back again later. That’s exactly what happened too! He came in, did a quick exam, asked a few questions, then told me to have a repeat ultrasound in October just to see if the lump had changed/ grown/ gone away. Up to this point, Ryker was the only sick household member. I made a point to disinfect, wipe down, clean, and repeat just so we could avoid the spread of the germs. Unfortunately, Ryker woke up Saturday morning with super yucky, gooey eyes. Trey and I were convinced he probably had pink eye or something on top of whatever else was going on. He was still running a fever, not eating well, and just wanting to lay around and be held. He. Was. Pitiful. Tucked in Mommy & Daddy’s bed. Yes. She’s in the Baby Bjorn. Naptime finally came somewhere close to 10:45am. Averlee threw a quick little fit when I put her in her crib, but went to sleep soon after. Ryker was so ready for a nap so he didn’t put up much of a fight. I started cleaning up a bit and putting away laundry when I heard Averlee let out this awful, awful scream. I had only heard her scream like this once before so I ran to the top of the stairs and into her room. It was like a nightmare. Averlee was laying in her crib, silent, motionless and her eyes were glazed over. She was looking out the side of her crib. I put my hand on her to shake her. She didn’t respond. I got down on my hands and knees in front of her crib and said her name a few more times before I noticed her color. My baby girl’s lips were turning blue and she was so pale. I yelled for Gavin to call 911. Friends, I had to do CPR on my own child. I am grateful I knew how, but I hope I NEVER have to do that again. Everything was a blur. It was hectic. My mother-in-law was yelling. Ryker was crying. My dog, Harper, was howling. I was trying to talk to the dispatcher and stay calm enough to make complete sentences. It took the ambulance less than seven minutes to make it to our driveway from the time we made the call. By the time the paramedics came in the house to check Averlee, she had finally come out of her seizure, but she was still not acting like herself. Just to be on the safe side, we had her transported to Vanderbilt via ambulance. Of course, I went with her. I must say, I had a lot of time to think as Averlee and I rode in the back of the ambulance to Nashville. I just held her and wondered how much more God planned to put on my plate. I prayed He would hold off on giving me anything else for a few days so I could maybe process everything I was already faced with. Funny how things don’t go the way we want them to sometimes, right? Averlee was discharged from Monroe-Carell Jr. Children’s Hospital at Vanderbilt about an hour after we arrived. The doctors and nurses concluded that she had another febrile seizure. They gave us a prescription for medication to give her when she has another one. They also gave us instructions to follow-up with neurology within the week just as a precaution. On Wednesday, September 14th Averlee had an EEG and we met with a Neurology Nurse Practitioner who had reviewed the EEG. The NP did not see anything too alarming on the EEG; however, due to the way Averlee seizes – eyes fixed to the right, left hand twitches, and she stops breathing – she is ordering a brain MRI. Averlee will be sedated for the MRI. The MRI is basically a way for us to see if there is anything else going on in that tiny little noggin of hers. As scary as that sounds, I am at peace and am standing in faith Averlee will receive a good report once this test is completed. She will have her MRI sometime next month. 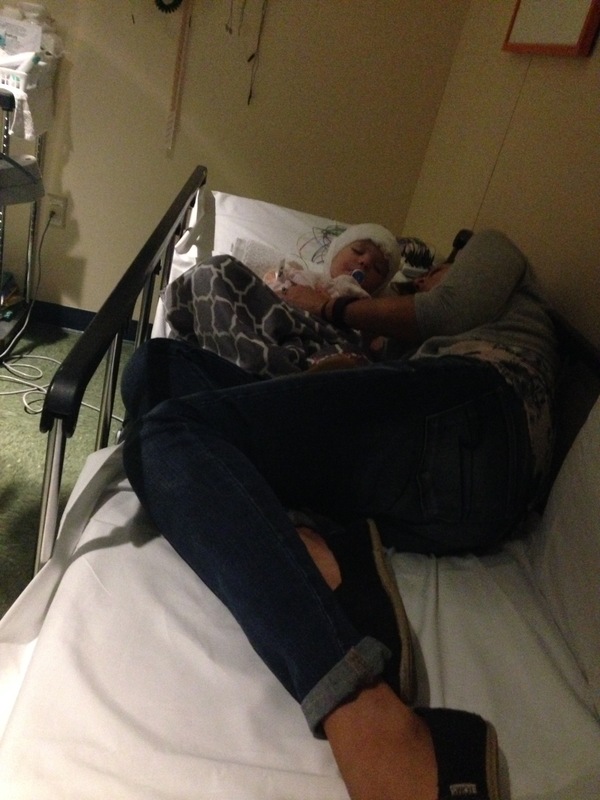 My brave little girl during her EEG. By the end of last week, Ryker, Averlee, and myself were all fighting colds. The silver lining to all of this is I have been getting lots of precious baby snuggles. I have missed them being themselves though. I know one day I will look back on the last 12 days and think, “Oh that wasn’t so bad afterall”. Today though? Today I feel like my head has barely been above water. I feel like I have spent the last week and a half praying this mountain would just move so we can get on with our lives! I will miss the snuggles and the kids needing me, but I hope I never have everything happen at once again. Shew.